Made for the ever-changing workspace, the TaskMate Go Home by HealthPostures ensures comfort and better ergonomic positioning with the easy installation of one desktopper. Make yourself at home, in your home or your office, with this manually-adjustable sit-stand workstation. Enjoy the freedom to height adjust to your sitting and standing preferences, all in mere seconds. Two tiers, one a worksurface and one a keyboard tray, keep you set up in the ideal ergonomic posture so you can work in ways that are beneficial for your body. What else do you get from switching up your stance? A boost of energy and better circulation are just a few of the health perks you get when you switch to a height-adjustable workspace. 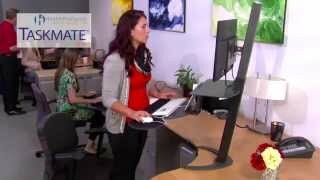 Better, more comfortable work is on the horizon with the HealthPostures TaskMate Go Home - Single or Dual Monitor. Max LCD size single 30"
Max LCD size dual 24"
The single VESA mount for the TaskMate Go Home by HealthPostures holds one LCD monitor, up to 30 inches in size. Going from seated to standing is a breeze; just grasp the lever and the large work surface, keyboard tray, and monitor will slide along the column so that you can stand up and get to work. When one monitor just won't do, go with the dual VESA mount version of the TaskMate Go Home by HealthPostures. The sturdy column holds two monitors, up to 24 inches in size. Each monitor can be adjusted independently to find the right viewing position. Height adjustment is seamless, just grab the lever and stand up to work. The TaskMate Go Home desk converter is available with your choice of two different work surface colors, cherry or dark oak. Both the large work surface and keyboard tray will come in the finish chosen. The rest of the TaskMate Go Home, including the column and clamp stand, are gray. $522.00 List Price: $604.00* The list price is the same as the MSRP (Manufacturer's Suggested Retail Price). It may not necessarily be the price at which the product is sold.